Hello again, this time from our home base, in the Netherlands. We have finished our field work, after which we, the students, separated our ways to either discover other parts of Scandinavia or to return to our homes. I reunited with the busy concrete world in the Netherlands. I definitely miss the trees, the amazing views and the smell of Ledum. 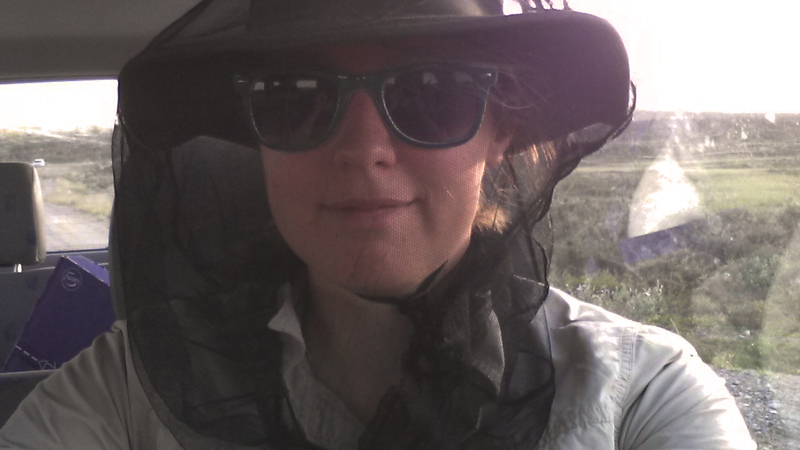 So let me bring you back to the final days of our field work. As I told you in my previous post, we had a lot to do in a short amount of time. On Wednesday we collected the second cafeteria. We counted the number of seeds still present and checked whether the seedlings were damaged or not. We also collected the cameras and set traps for the voles. This time there were no ladies captured by our cameras. 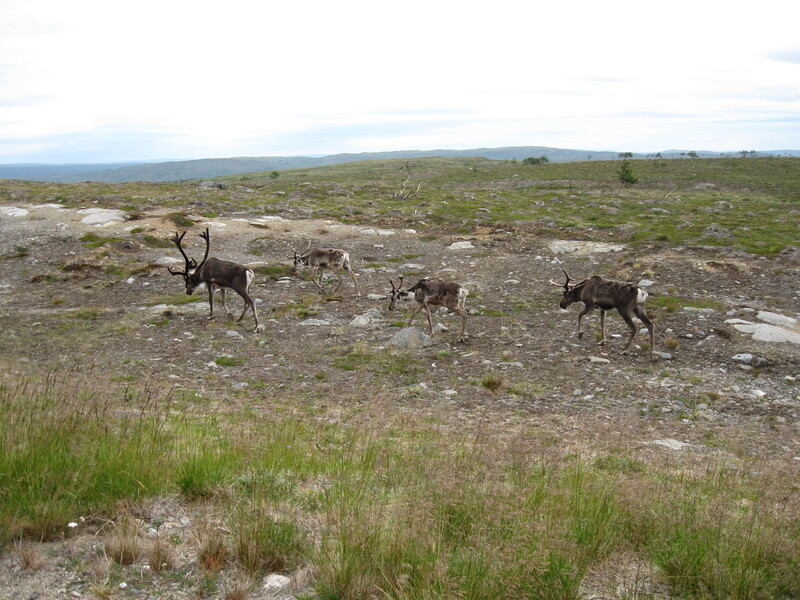 However, a different species was enjoying the palsa mire: reindeer. We were very happy to capture reindeer on camera, as the site of our second cafeteria experiment supposed to be a grazed area. 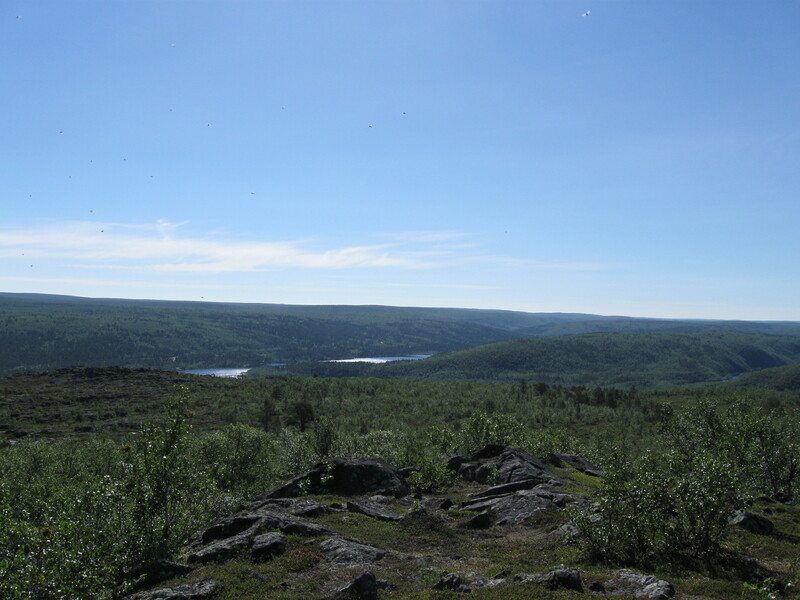 The next day we went back to Pulmankijarvi-jaggi to collect the resin bags and to check the emergence of the seeds and the survivability of the seedlings. Although we were a bit uncertain if there would be germination, we already found germination at our second pounu. It gave a great feeling that trees are able to germinate on pounu. After this success we were even more enthusiastic and determined to find every seed back. This was however a though job. It was like looking for a needle in a haystack, but then more difficult as seeds are not shiny but have a good camouflage colour. After a long day of seek and find, we returned to the traps we set the day before and checked whether we captured something. Indeed, we captured 6 voles. Hereafter it was time to reset the traps and go home to have a good meal. On Friday we went to Vaisejaggi to collect the resin bags and to check the emergence of the seeds and the survivability of the seedlings in our ungrazed site. This site was definitely a different story. We could hardly find the seeds and we found only a few germinated seeds. It was a rainy cold day, but at the end of the day we were satisfied as we had finished most of the hard work. We only had two days left before our travelling started. The next day we only had to send a package with samples to the Netherlands and to collect the traps at Pulmankijarvi-jaggi. As this would not take a long time we enjoyed the views Finnish Lapland have to offer once more and we also did some final shoppings to survive the at least 37 hours journey towards home for most of us. This time we captured 9 voles in the traps. It seems that the grazed site has more voles than the ungrazend site, which might be an explanatory variable whether trees are able to establish in a certain area. Although we have some results, next years will be important to gain more insight on the role of shrubs on the establishment of seedlings of trees on pounu with and without permafrost. I am curious if and which answers we will find on our questions in this topic. I enjoyed starting up a new research, the dynamics that go with it and working in such a beautiful environment. Thanks again for checking this blog and hopefully you will be updated by another student on this research next year. Hello again from the Kevo Subarctic Research Station. We are reaching the end of our field work, but before we are wrapping up, I will give you an update on the past 1.5 weeks. After the planting of experiment 1 we also removed the cameras at our first cafeteria experiment. The big question was of course, will there be any voles? Yes, we captured a vole and also a bird and a female of another curious species, a human. Apparently our research site was also accessible for hikers. It must have been strange to find poles with ribbon, sticks with coloured tape and cameras in a palsa mire landscape. At this site we did not had a research sign yet, so it is not surprising that the lady was curious enough to take photographs of our experiment. Perhaps not knowing that by doing that she was captured herself by our cameras. 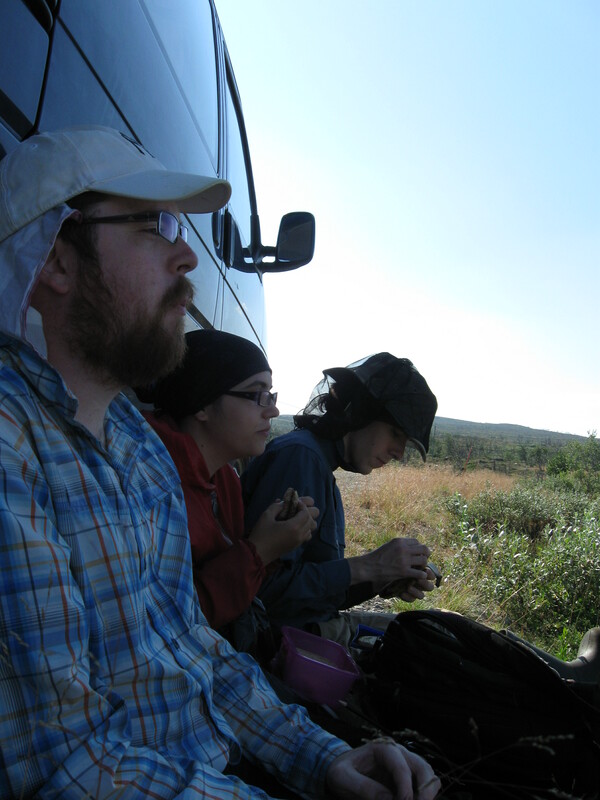 Two days later we went to Pulmankijarvi-jaggi to set up the second cafeteria experiment. This was quite exciting as we had to search a new area of palsas and pounu of which we knew it existed but we did not know if it was a good site for our research. Finding the area was actually not hard at all, it was only 5 minutes walking from the road. The area seemed to contain enough pounu for our research so we started to set up the second cafeteria experiment. Again we selected 15 pounu with and 15 pounu without permafrost. Hereafter we made the plots and we brought the camera traps in position. The next day we went back to plant the seedlings and to sow the seeds. This day appeared to be a reindeer day as we saw reindeer many times on our way to the site and near the site throughout the entire day. Although the reindeer at our site were the same reindeer every time, it was interesting as the other days at Pulmankijarvi-jaggi we did not see the reindeer that often. Our plots were further apart from each other than in the first cafeteria experiment, so at a certain moment we were hoping that the reindeer were not eating our seedlings that were left at the first pounu. Luckily everything went well and after all the cameras were turned on, all our experiments were running! Of course we celebrated this with some ice cream in the evening. After one free day it was time to collect the first cafeteria and to find out if some of the seeds were gone and the seedlings were damaged. Indeed, in some plots the seeds were gone, while in others the seeds were still there. The seedlings were merely touched, so it seemed that the voles liked the seeds more than the seedling. However, to investigate if there were actually voles on our pounu we had to set traps. With the traps we caught four voles and one shrew, which we found on the pounu were the seeds were gone. Although I do not like trapping, it was nice to have some results. For the next part of our research we needed to sample leaves of 22 tree species and measure their diameter at breast height in the arboretum experiment of the Kevo station to assess epigenetic variation between the collection sites. However, after studying the ‘maps’, pieces of paper with row numbers and codes, we found out that we could only do 10 to 12 species. Of some species not enough trees were planted and other species were not planted in all of the three arboreta. As we could only collect leaves of 10 species on our first day, we had to go with leaves of just 10 species. The arboreta research is a project which will be done in collaboration with another professor at our university. As this is my project I was excited to start with it. It was quite a puzzle to find the species, or actually the rows where the species should be. Luckily we had some help of Mara, an intern at the Kevo Subarctic Research Station. She taught us how to read the maps and to find the rows. After two species we had to find out the other species ourselves, but I really liked the ‘quest’ for the species, probably because I enjoy making puzzles. The three arboreta differ quite a lot between each other. The first arboretum was on a steeper slope and had more trees surrounding the site than the other two arboreta. The second arboretum had a greener understory than the other arboreta and was a bit more chaotic than the first arboreta. The third arboreta, however, was by far the most chaotic. When you opened the gate, you could not see the rows of trees. You first had to walk between birches and a lot of moss before you saw them. Then after 36 rows, the rows are suddenly from fence to fence and the codes are different from row 56 onwards. So as you can imagine, we spent a lot of time searching for the right species here. An additional interesting phenomenon was the ants within this arboretum. 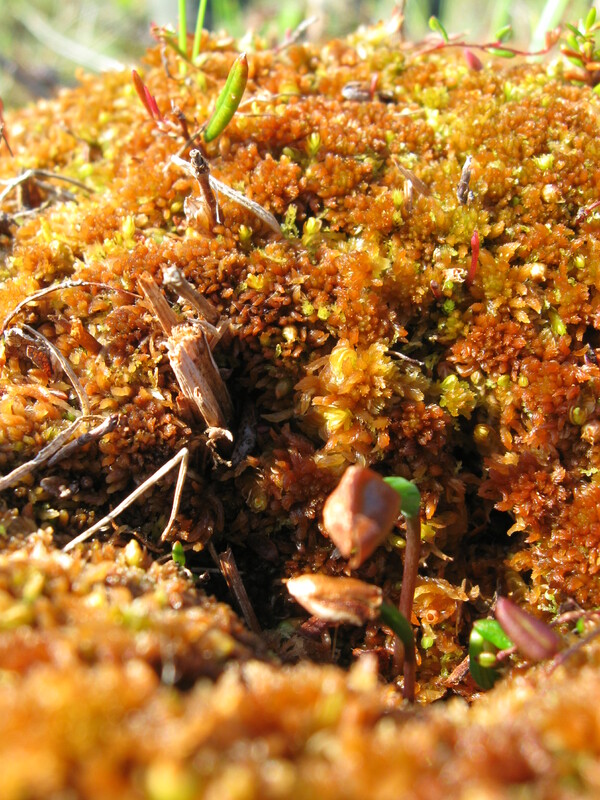 There were a lot of ants, which made some kind of high ways through the moss and had built gigantic ant hills. I found this very interesting and I could spend an entire day watching them, if we had the time. Now we have finished our arboreta research and we have only 6 days left to collect our second cafeteria, to set traps and collect them, and to check the emergence of the seeds and the status of the seedlings in experiment 1. A lot to do in a short amount of time in this beautiful country. I’m definitely going to enjoy every second of our time left here. Thanks again for visiting this blog! Hello everyone, thanks for checking our blog, I’m Mariette and I will keep you updated on our research. Two weeks ago we arrived at Ivalo Airport, at least 4 of us, as two students decided to take the long economic travel with buses and trains. We picked them up in Ivalo and in two takes we drove to the Kevo Subarctic Research Station, our stay for the next five weeks. I have never been to Finnish Lapland or even Finland so I was amazed by what I saw. Finland is overwhelmingly green, with beautiful rivers and lakes. The good weather was of course playing a role in this as well. Every now and then there are a couple of reindeer walking next to or on the road and the smell of the trees is really nice. To put it in perspective, I’m from the Netherlands and the forest cover there is about 11 percent, which is 3,650 km2. 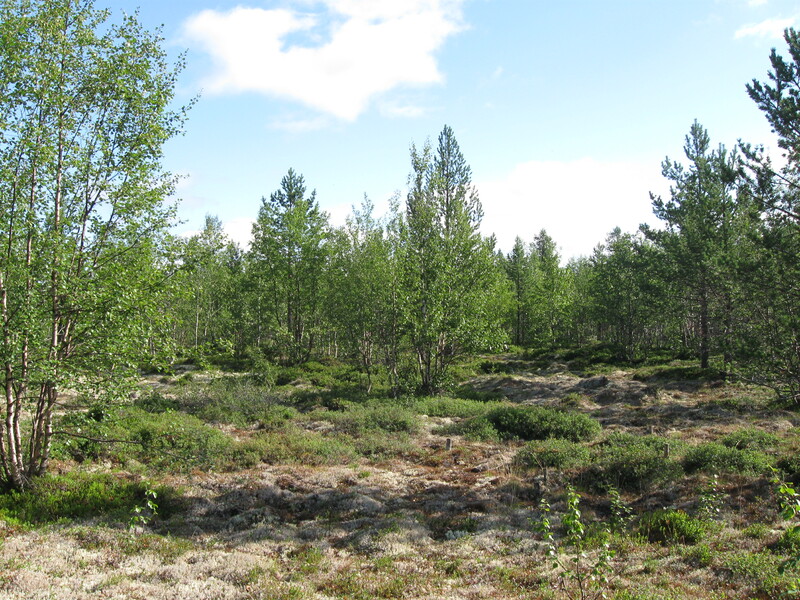 In Finland the forest cover is about 74 percent, which is 225,000 km2. But you might know this already. This at least gave us a lot of excitement to start with our research. In the first week we selected the sites where would like to run our experiments. 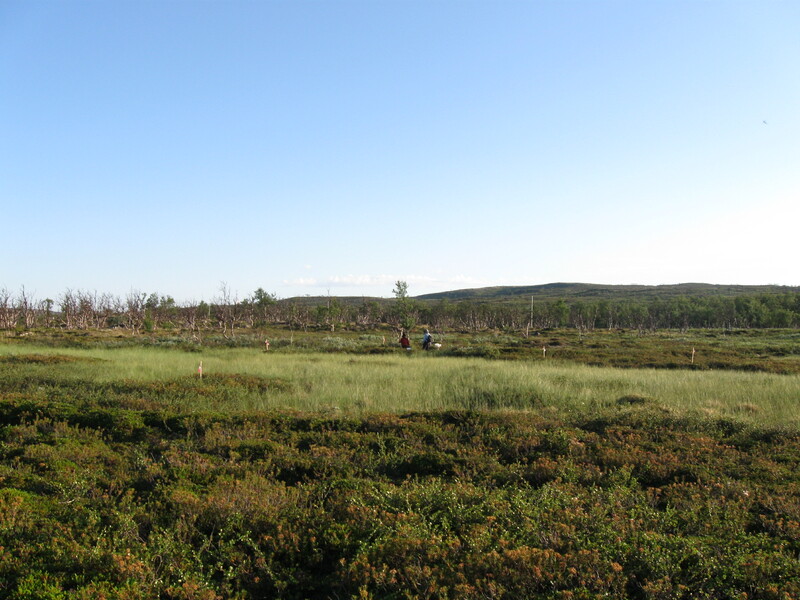 The aim of our research is to understand the ecological conditions that trigger tree regeneration and expansion in the boreal and tundra region. 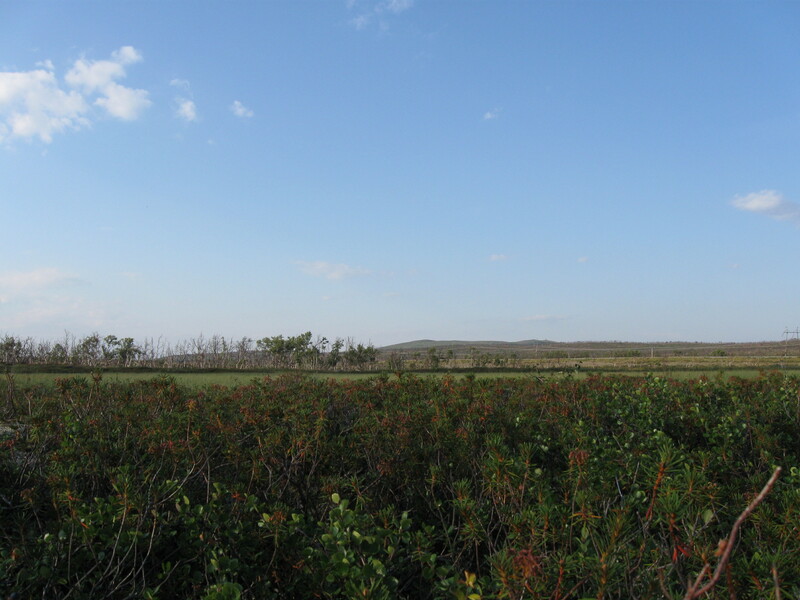 Vegetation might shift due to climate warming and a possibility is that the boreal forest might expand in the direction of the tundra. 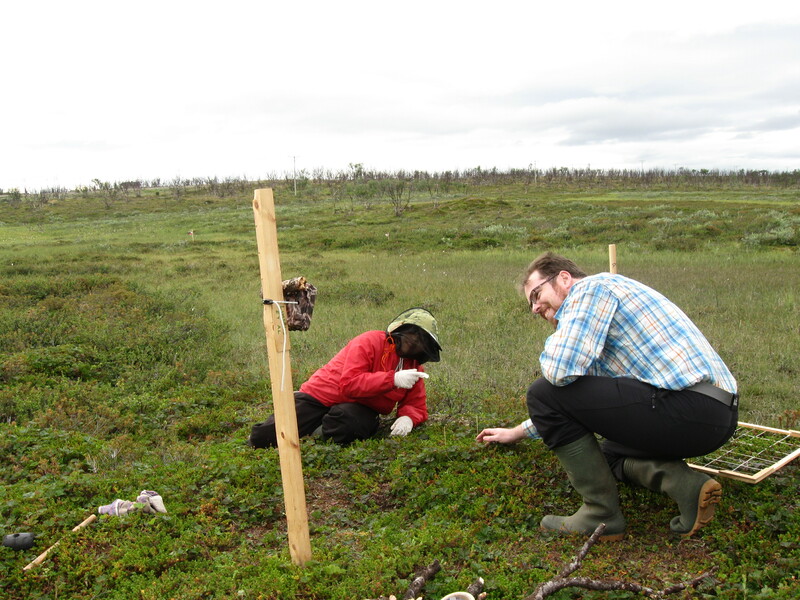 Our main question is whether shrubs facilitate tree seedling establishment under contrasting permafrost conditions. To answer this question we are setting up our experiments in palsa mires. 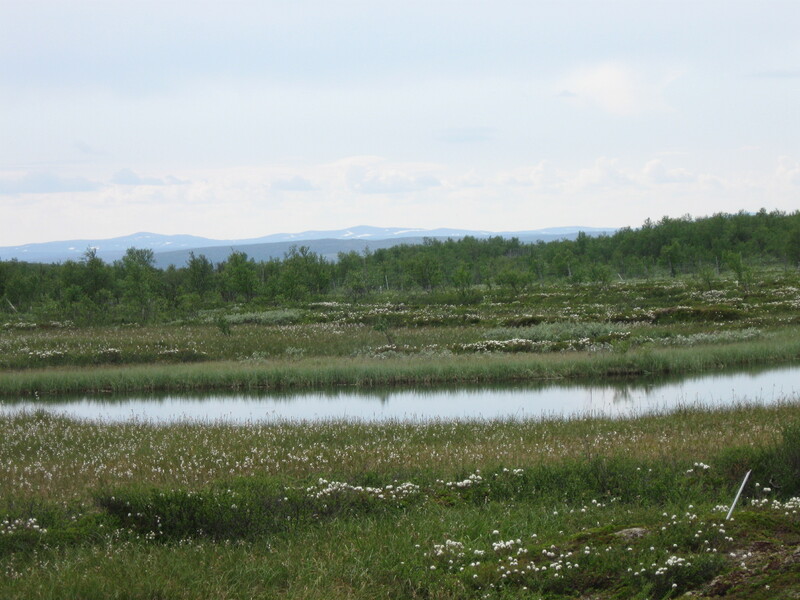 The palsa mires consist of elevated features with patches of permafrost, the palsas, and a poorly drained wet environment without permafrost, the mire. 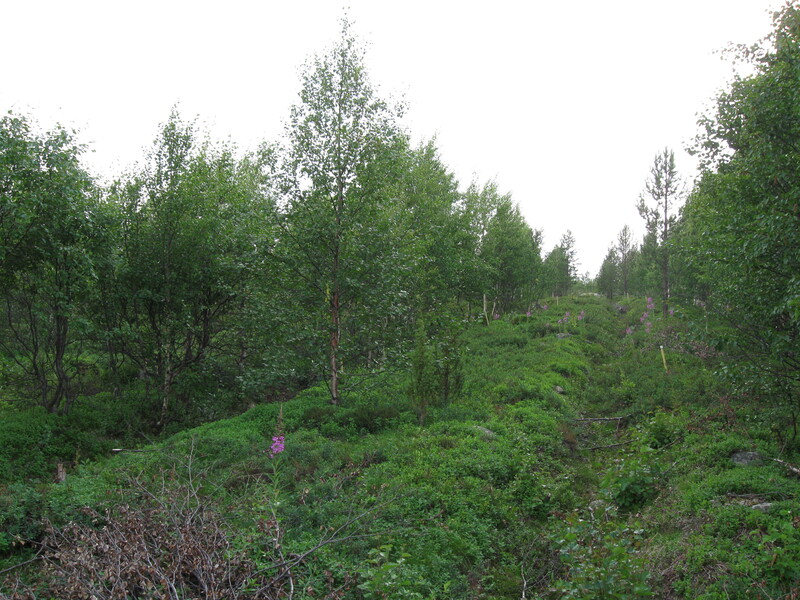 The palsas support shrub vegetation, which differs in height and density per palsa, depending on the amount of permafrost. Selecting sites is an interesting thing to do. I discovered how the Finnish mountains looked like from the top, how not to sink in the mire and how nice it is to walk with a couple of ecologist through a certain ecosystem and stop everywhere where someone sees something interesting. You probably recognize the trips you make with friends that are not ecologists/biologists or something like that and they think it is quite odd to stop for every little interesting nature phenomenon. Our quest for suitable sites made me realize that I’m not the only one who is doing that, which is quite nice, also to share your thoughts and interests. We decided with the help of Harri, a professor at the University of Helsinki who has also worked with Milena and Juul in Southern Finland, that we could conduct two experiments in addition to our correlational studies. After this big discussion the professors left and we, the students, are now on our own. This might sounds scary to leave the research in the hands of four students, but for us, or at least for me, it felt as excitement, now it will finally really starts. We are enough prepared, we practiced almost every measurement and talked trough the protocols so everything will work out fine. In the second week we started setting up the experiments. 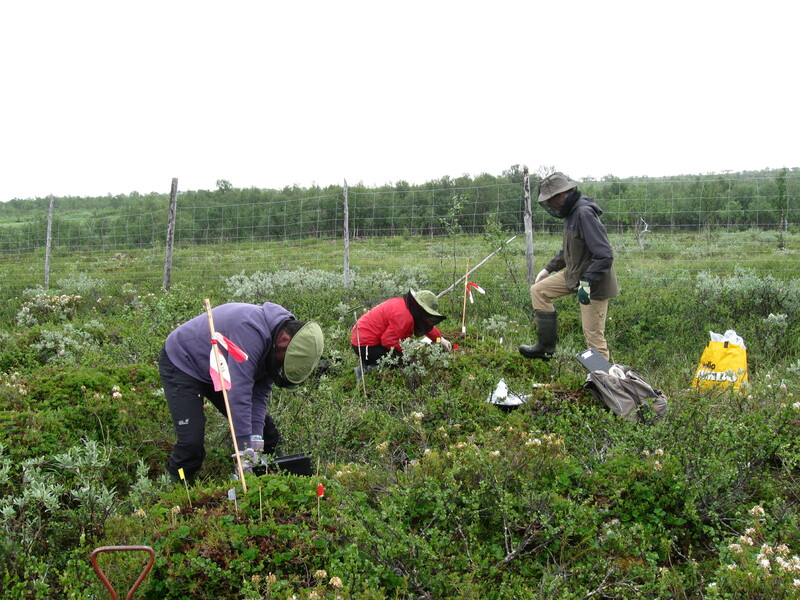 In the first experiment we aim to assess the role of shrubs on the establishment of seedlings from four tree species on pounu with and without permafrost. Pounu is a Finnish word that is used for small palsa features. 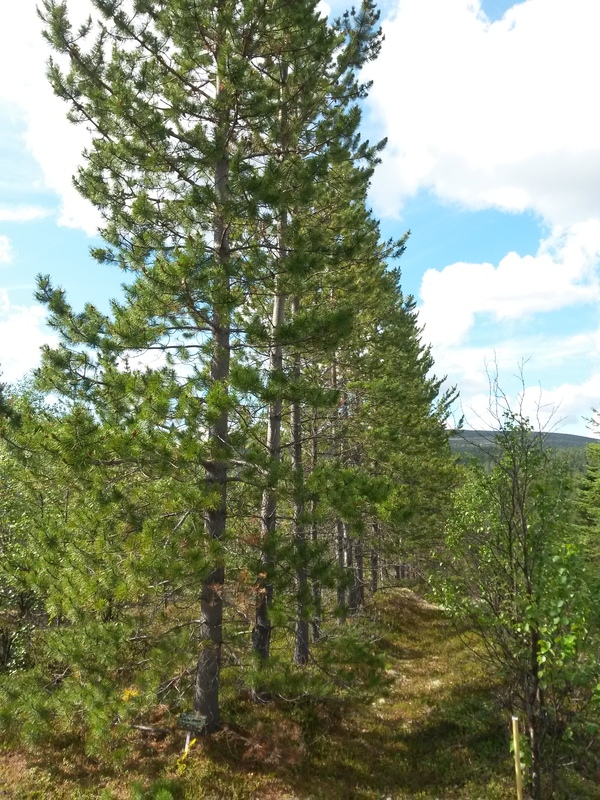 The tree species we will study are Betula pubescens (Mountain birch), Picea Abies (Norway spruce), Pinus sylvestris (Scots Pine) and Larix Sibirica (Siberian larch). 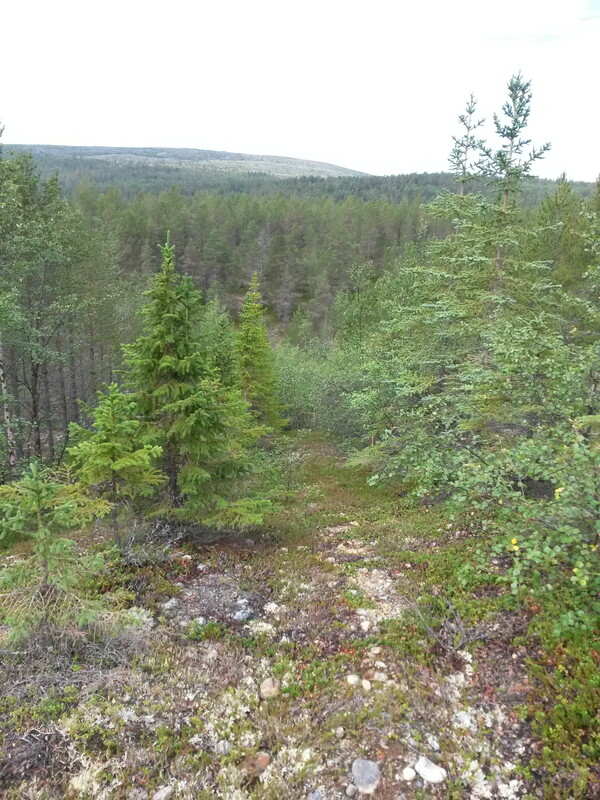 In Vaisejaggi and in Pulmankijarvi-jaggi we started a planting experiment in two palsa mires with contrasting reindeer browsing. 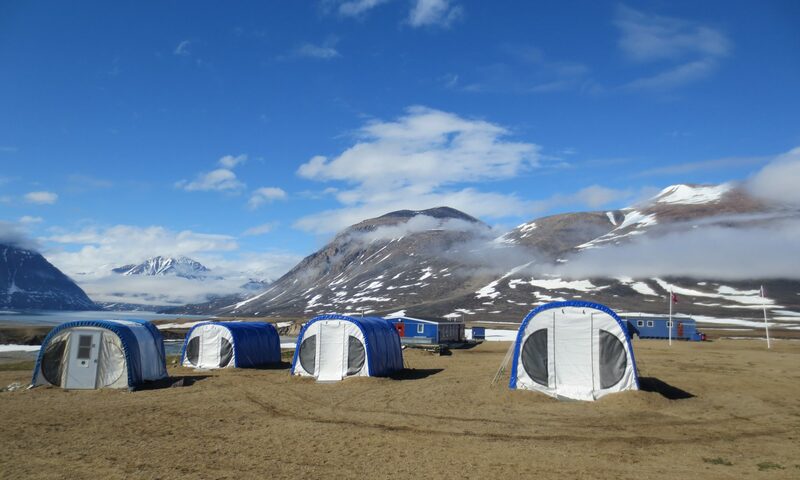 At each site we have selected 15 pounu with and without permafrost. On each pounu we laid out four plots of 20x40cm. Two plots were situated at the top of the pounu, whereas the other two were placed at the edge of the pounu. Before we removed the vascular plants in half of the plots we assessed the species in each plot with the help of our own made herbarium. Within these plots we will plant seedlings and seeds of our four tree species. We will also record environmental measurements, such as the soil temperature, soil moisture, irradiance, aboveground biomass and nutrient availability. After 3 weeks and next year we will assess the emergence of seeds and survival of seedlings. In the second experiment we want to assess the potential effect of voles on seeds and seedlings of the four tree species. In the same palsa mires, but further away from the planting experiment, we started a cafeteria experiment. 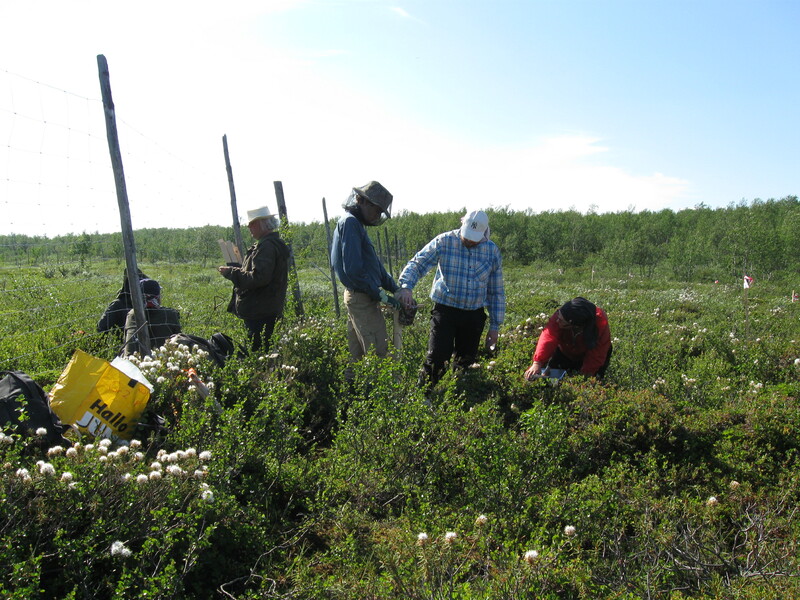 At each site we selected 15 additional pounu with and without permafrost. On top of each pounu we established two plots. 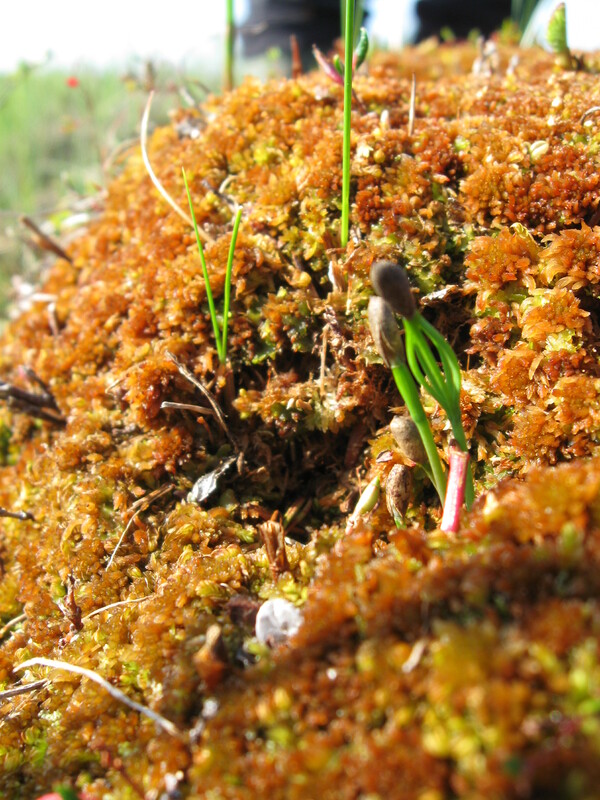 Effect of voles on seeds and seedlings will be assessed by recording damage on seeds/seedlings offered inside the plots. Vole presence will be recorded by three techniques: counting vole burrows within a 1.25 m radius from the middle of the selected pounu in experiment 1, so the voles are not disturbed in experiment 2, track-camera’s for 6 pounu for 5 days at each site and death trapping for all pounu in experiment 2 for 2 days per site using the same trapping lure as that is used by Kevo station to assess vole densities. In addition to the above experiments, we will also collect leaves of 22 tree species in the arboretum experiment of the Kevo station to assess epigenetic variation between the collection sites. The collecting sites are all in a different environment. The variation will tell us something about how well the tree species adapt to their environment. We expect that the variation between species will be higher if the trees adapted to the environment than when they did not adapt. The tree species were planted about 40 years ago and they used all species that were treeline species somewhere in the world. This week we started planting in experiment 1, which means that we had to count the seeds and put them in tubes in groups of five. After one day of counting, we started planting the seedlings and seeds in both Vaisejaggi and in Pulmankijarvi-jaggi. The planting gave me the feeling of normal gardening but then in the arctic. Although we had to work long days, the realization of experiment 1 gave us an exciting and satisfied feeling. At the end of this week we will also start the cafeteria experiment in Pulmankijarvi-jaggi. Hereafter, all our experiments are running. Thanks for visiting this blog, I will keep you updated!